FATFS library (HAL LIB 20) is a “generic” library for all FAT related implementations, such as SDCARD, USB FLASH, SPI FLASH and also SDRAM can be used with proper FAT initialization. My FATFS library currently supports only SDCARD communication with SDIO (STM32F4xx) or SDMMC (STM32F7xx) or SPI on both families. There is no big difference between them and you can treat them as the same peripheral with only different name. In case you are interested for FATFS based on STD libraries for F4xx series, check here. Dynamic allocation is used when new file should be created. You need at least 512 bytes of free memory in HEAP region for malloc to allocate data, otherwise, f_open function will return FR_NOT_ENOUGH_CORE result. You can force FATFS to use static buffer for all files (not thread safe) or to use stack for files, but you have to increase stack to allow that or you will have stack overflow. Settings can be changed in ffconf.f file from FATFS library. f_mount(&fatfs, “SD:“, 1), which increases transparency between multiple FATFS related low level devices. Other implementations are listed below. For USB MSC: f_mount(&fatfs, “USBHS:“, 1); for USB HOST in HS mode. For USB MSC: f_mount(&fatfs, “USBFS:“, 1); for USB HOST in FS mode. For SDRAM: f_mount(&fatfs, “SDRAM:”, 1); for SDRAM implementation. This option does not work yet. Check example for more info how to use this aliases. Library supports 2 modes of communication with SDCARD. First, which is faster and better is SDIO/SDMMC, or second, slower communication with SPI. 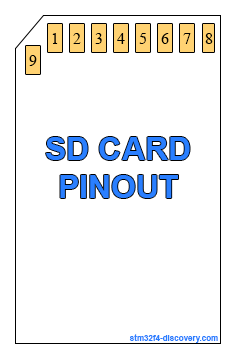 You can see default pinouts in table below for SDCARD. There is also CARD detect pin on SDCARD connector if you use it. By default, this feature is disabled in library, but can easily be enabled. In case, you want CARD DETECT pin in your project, you can open defines.h file and define your settings for CARD DETECT pin. Default CD pin is PB6 when pin is active, but can easily be changed. Default SDCARD communication is SDIO/SDMMC and is automatically enabled if settings are not overwritten. For getting SDIO/SDMMC properly to work, you have to add these files in your project. Default mode for SDIO/SDMMC is 4-bit mode, but in case you want to save some GPIO pins, you can use 1-bit also. For configuration, open defines.h file and add/edit settings you need. If you need (for come case) SPI implementation instead of SDIO (I don’t prefer SPI when SDIO can be used), you have to manually enable SPI for FATFS. To do this, open defines.h file and add following lines. To get SPI into working state, you will have to add these files into project. Check examples for USB MSC Host on Github to see how to use it when you have HS mode and when you have FS mode. Note: if you won’t include low level driver file, you will not get any compile errors, because I have defined functions for low-level driver with __weak parameter. You will just always get errors from FATFS related functions. To run USB MSC Host, you will also need my USB library with HOST stack. Not in working state yet. Coming soon! * - You will get new file data: "fghijklmnoprstuvwxyz"
Example below is basic and shows how to write data to SDCARD. Example was tested with STM32F7-Discovery board and STM32F429-Discovery board and I got expected result! Project is available on my Github account, download all libraries below.